Sam Cash is a vice president at Betaworks. Building and investing in startups is rapidly proliferating to the many, instead of remaining the preserve of the few. Silicon Valley is the innovation bellwether of our time. The concentration of talent and capital — as well as a culture typified by speed and boldness — has created trillions of dollars of shareholder value and pushed the envelope of innovation. The venture capitalists on Sand Hill Road have for decades dined on the fruits of funding entrepreneurs who travelled to the valley’s rich pastures or the alums of local academic institutions. There has always been a symbiotic relationship between entrepreneurs and investors, with often diverging goals. Investors have historically required face time, something founders have been willing to do as the balance of power has predominantly resided with the cheque writers. This has led to the concentration and subsequent clustering of talent and startups. Whether building processors, web or mobile products; proliferation has been global whilst the innovative companies and venture investors remained local. In other geographies policymakers have worked to replicate this model of innovation and concentration, in my view wrongly. In recent times venture capital has become near-homogeneous, or as Brad Feld argues often undifferentiated. In 2016, global venture investments totaled $134bn versus $40bn a decade earlier. In that same timeframe, accelerator programs have also exploded, from just two to over a thousand programs globally. Breakthroughs in technology, changes to regulation and socio-economic tailwinds are allowing talent and capital to be more widely distributed and at the same time closely connected. We’re witnessing the democratisation of a number of components of the startup ecosystem. This decentralisation is increasingly shifting startup creation to a broader populace. Today, we’ve seen a number of large company outcomes away from the mainstays of silicon valley, New York and London — Snap, Zayo, Mobileye, HomeAway, Retailmenot, Simplivity, LivingSocial, Waze, Supercell and ARM have all been created in comparative isolation. Startup funding has broadly has taken the form of either cash for rewards, cash for equity and more recently tokens. Reward based – Indiegogo and Kickstarter were at the forefront of the initial wave of crowdfunding, where cash would be exchanged for future products — with the financing allowing such products to be made. One of the most prominent changes has been in equity based crowdfunding. Last year’s introduction of the JOBS Act Title III, has further accelerated equity based financing — giving unaccredited investors the ability to invest in early stage startups. Equity based – AngelList has been a key proponent of this, allowing accredited investors to invest in angel syndicates run by, often, experienced investors or operators. In 2016, Angel List facilitated $190m of investment in over 460 startups and saw a number of their companies raise at over $1 billion. On a run-rate basis, that’s roughly the equivalent of a $570m angel fund. Tokens – Beyond this, we’re seeing a further, and more pronounced decentralisation of capital. The advent of the blockchain, firstly through Bitcoin and more markedly through Ethereum has given rise to new forms of currencies and startup funding. The blockchain provides open, decentralised networks on top of verifiable ledgers of record. It has also allowed us to philosophically ask ourselves what we perceive value or currency to be. More recently, we’ve seen the acceleration of initial coin offerings (ICOs) amongst startups and organisations. ICOs allow individuals to purchase organisation or startup specific tokens (cryptocurrency) within a specified timeframe. They do not provide the token holder with equity in the traditional sense but allows them to own a company linked public, tradeable security. 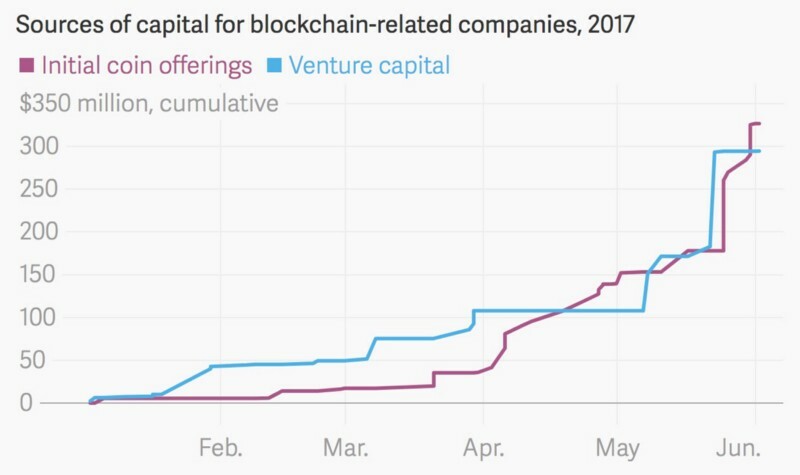 In the first half of 2017, ICOs have outstripped traditional blockchain venture capital funding, raising $327m of funding. Importantly, ICOs allow startups to quickly raise capital at the early stage whilst not having to undertake oft lengthy and expensive venture funding. We’re also seeing the ever-evolving nature of cryptocurrency. The Bancor Foundation has coded smart contracts into each of their tokens, allowing them to forgo being exchange traded. Tim Draper, of DFJ fame, joined as an advisor and investor. They raised a record (at the time, read: last month) $153 million worth of ether through a 3 hour token sale. We’ve just seen the record broken twice in last week; firstly with the Block.one raising $185 million, then Tezos raising $207 million. Whether raising this amount of money, so soon after inception, for largely unproven businesses will work remains to be seen. – there are already vocal naysayers. We’ve also seen attempts at building economically decentralised and transparent organisations leveraging the blockchain, such as the DAO (decentralised autonomous organisation). The DAO was built on Ethereum and raised over 11.5m Ether, as a new type of crowdsourced, crowdfunded investor-directed investment fund. The DAO provides it’s token holders with ultimate voting rights on projects and funding, with total transparency throughout the organisation. Though an interesting case study, the complexity of the code and operation led to a significant attack and the subsequent theft of $60m worth of Ether and a ledger hard fork. Importantly, these funding methods do not give token holders an equity holding within the companies and put coin holders in undefined legal waters. Beyond this, the lack of regulation and oversight provides equal risk and opportunity for participants. Regulators will have a pronounced effect on the outcome of these funding methods, as they continue to try and understand the rapidly shifting sands. As Fred Wilson alludes to, investing is a specialised skillset, one closer to an art than a science. With early stage outcomes usually taking years to play out. To date, crowdsourced wisdom has been hard to qualify and quantify in investing terms. 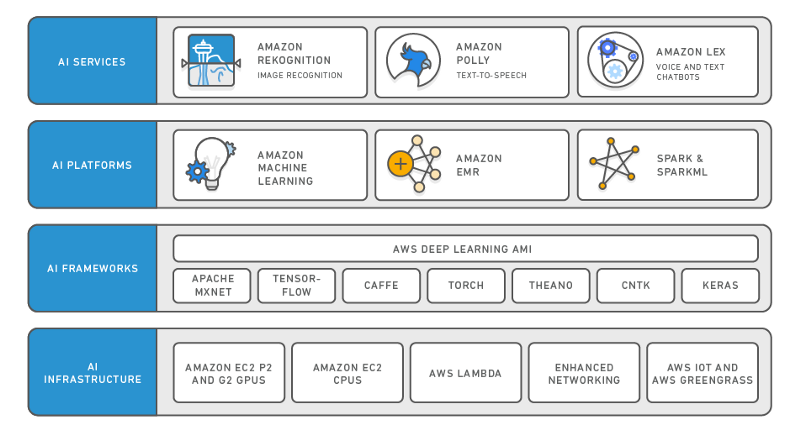 Cloud infrastructure has been a pervasive force in allowing teams to quickly stand up products without significant back-end investment and inflexible architecture. We’ve seen cloud encompass infrastructure (servers, storage), SaaS (browser, email, CRM), pllatform (app store, blockchain, dev tools, database) – with incumbents increasingly getting deeper into this stack. The advent and inevitable availability of quantum computing will also further increase the power of the cloud. As the arms race intensifies between companies such as Intel, Google, IBM and Rigetti to pack more qubits onto single chips. Importantly, the potential power of a quantum breakthrough will yield a potential exponential power law for applications such AI and cryptocurrency as computation times are dramatically diminished. Distributed workforces have also benefitted from expansive networks driven by technology and an attitudinal change in job market entrants. This trend is manifesting itself in two separate ways for startups; pay-per-play contract workers and remote employees. Both can drive significant cost and time efficiencies to workers and organizations alike. In the last 10 years, 94% of net job additions in the US have been from independent workers, with up to 60% of the population likely to engage in this type of work by 2020. Distributed workforces are becoming a significant factor in the new economy and with startups, they should be actively embraced. in the age of information, this is self-evident with the near endless content produced about startups (yes, I get the irony here). We’ve seen some more procedural efforts such as Y Combinator’s MOOC Startup School of which 1,500 startups just “graduated” and the TechStars Anywhere program which allows founders to undergo a virtual remote accelerator. Distribution of products has also become easier for founders. We’ve seen channels like the App Store, Product Hunt, Twitter, Medium and a slew of news site distributing to an ever increasing audiences of adopters. The explosion and atomisation of the startup stack, as well as increasing changes to the funding environment will continue and likely accelerate. Our perception of what a company actually is will also morph through time – with more decentralised teams, services and decisions, making up some of the key tenets. There will be opportunities to create value at the early-stage by providing founders with a different set of services, on top of and at a parallel to capital and the startup stack. Those best placed to take advantage will be those who provide founders with a platform of support and services. I would like to see a total on-demand turnkey solution for the startup stack; including: workspace, SaaS, financing, mentoring and workforce solutions. As tech entrepreneurialism proliferates, the industry should be more supportive of founders building sustainable technology products and businesses, either for profit, the greater good or both. Great products and solutions are not the reserve of monolithic tech ecosystems but should be encouraged to be built anywhere. Let’s not only support startups that fit the venture investing parameters, let’s create an ecosystem where great tech companies can be built and supported by all.